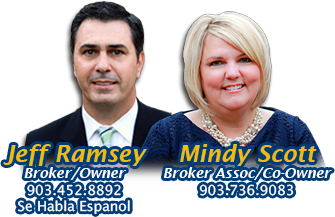 Jeff Ramsey is principle owner and Broker of Ramsey Realty Group; he started selling Real Estate in the Longview and East Texas area in 2007 after serving over 20 years in the United States Air Force. Jeff is a graduate of Louisiana Tech University, Community College of The Air Force, and Union Grove High School. Through his personal experience in moving more than 25 times during his life, he personally knows that relocating one's family and self is a stressful, yet exciting time for everyone. Jeff’s goal is to provide a unique top-quality service in representing his clients in the most professional manner by listening to their needs and wants, then providing them the vital information needed to make an informed decision. His knowledge and experience coupled with discretion when working with clients is unmatched in the local market, with over $65 million in real estate sales over the past 5 years. He has built over 25 homes and considers the knowledge gained as an edge for his clients. He firmly believes that when you find an agent that listens to you and has your best interest in mind, you will then find your family’s home. Jeff is married to Dr. Ariadna L. Bory. He has four children, and they are the reason he puts so much time and effort into making this a successful career, and always treating clients the right way; he believes in always “doing the right thing”. Jeff’s top priority is representing and serving his clients wants and needs with loyalty and integrity. A few Jeff’s accomplishments include, East Texas Rookie of the Year, National Television show—“My First Home”, Top Producer 2008-2013, Vice-President for the Advocate Texas Osteopathic Medical Association, Non-Commissioned Officer of the Year and numerous others both inside the community as well as his military career.